If you are flying into southern Florida for a cruise from Miami, there is some good news — the area has multiple airports that you can use to get to your ship. There’s no question that flying into Miami International Airport is the most convenient if you are sailing from the Port of Miami. The airport is just about 10 miles away. But if you can find a cheaper deal flying into Fort Lauderdale-Hollywood International Airport (FLL), then you can still make it to the port easily. The Fort Lauderdale airport is about 25 miles from the Miami cruise port. No matter what mode of transportation you take, expect the ride to take at least 45 minutes — sometimes much longer given South Florida’s notorious traffic. The good news is that with cruising and tourism being such big business in the region, there are plenty of options to get you from the Fort Lauderdale airport to the Miami cruise terminal. If you are traveling with two or more people, then using a rideshare service like Uber or Lyft is usually your best option on getting to the Miami cruise port. These services offer pickup at the Fort Lauderdale Airport and provide service to both Port Everglades and the Port of Miami. When you arrive, simply request a ride through the app on your phone. If you’ve never used a rideshare service, they are actually pretty easy to use. Simply download Uber or Lyft to your smartphone. Once downloaded, you can set up your account in the app. Your account is tied to a credit card, so no money changes hands — it’s all taken care of through the app. When you arrive in Fort Lauderdale, simply pull up Uber or Lyft and request a ride. It normally takes less than 5 minutes for your car to arrive. The cost of an Uber or Lyft is estimated at $35-45 each way, for up to four people (pricing is based per car, not per person). Larger vehicles are also available for a higher price. Taxis are another option from the Fort Lauderdale airport to the Miami cruise port, however, they are more expensive than using a rideshare like Uber and Lyft. The estimated cost is about $75 each way, for up to five people. That’s considerably more than other options. While taxi cabs are a more expensive way to the port, if you aren’t comfortable using Uber/Lyft, then cabs are a widely-available option at the airport. If there are lots of people headed from the airport to the cruise port, it makes sense that they can share a shuttle. The Fort Lauderale airport offers the GO Airport Shuttle, which provides a shared van back and forth from the cruise port. Rates for the shuttle are around $25 per person, each way. That’s considerably cheaper for most parties (unless cruising with a group) than compared to a taxi cab. In addition, GO Airport Shuttle also provides private car service for an upcharge if you don’t want to ride with strangers. The cruise lines offer service between the Fort Lauderdale airport and the Port of Miami. The bad news is that they can be pricey and not very flexible (you’re on their schedule, not vice versa). But the good news is that your transportation is taken care of by the cruise line so there isn’t a danger of missing the ship if your transfer arrives late. For pricing, you’ll want to check your specific cruise line. However, expect it to be more expensive than nearly every other option. For instance, Carnival provides transfers from the Fort Lauderdale to Miami for $31 per person, each way. Norwegian Cruise Lines offers transfers for $25 per person, each way. 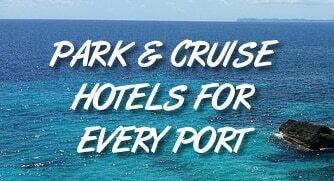 As well, cruise line transfers are offered only on the day of the cruise and can’t make any stops on your way to the port like a taxi or Uber/Lyft may be able to do.